This is a marvellous main; everything baked to perfection in one pretty parcel! Simple but special! Preheat oven to 200°C (400°F). To make the green olive dressing, place the olive oil, lemon zest, olive, vinegar and salt and pepper in a bowl and mix to combine. Set aside. Place the garlic, lemon zest, wine, salt and pepper and chicken in a bowl and mix to combine. Set aside for 10 minutes. Layer 2 x 30cm x 40cm pieces of non-stick baking paper on a tray and fold 3 edges in to form an envelope, leaving 1 edge open. 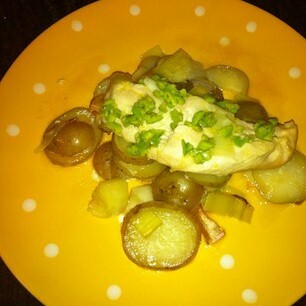 Place the potato, leeks, chicken and butter in the parcel and fold the remaining edge to enclose. Bake for 30-35 minutes or until the chicken is cooked through. Carefully open the parcels and top with the dressing to serve.